We are doing our best to balance a first class running event with the needs of our Bend neighbors. We know it's not easy to have runners take over your streets on a Saturday morning and we want to minimize the amount of disruption to your commute around town on Marathon Weekend so we wanted to provide a guide to where the marathon routes will be going and what to avoid the morning of the marathon. With the Bend Marathon taking place on April 20th the same day as the Summit Invitational we want to make sure we have as little impact as possible on the coaches, volunteers, and participants trying to get to and from the meet. 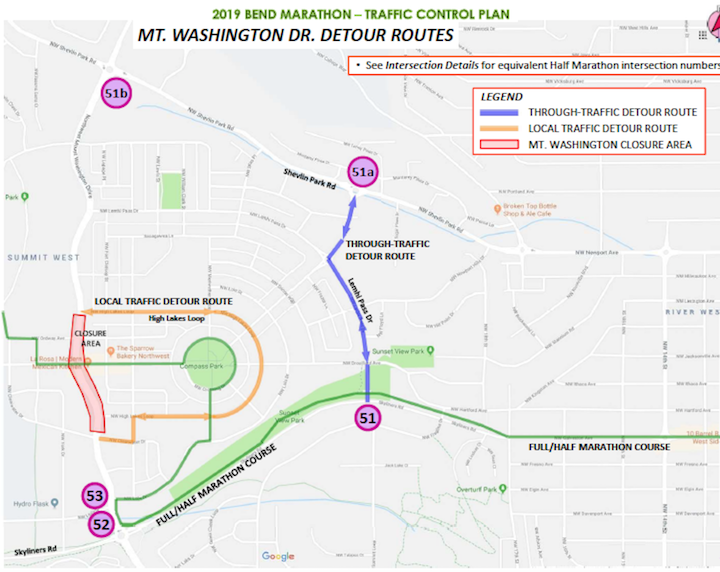 The marathon and half marathon will be taking place in the morning and be through the Summit High School area between 7:40 – 9:00am with multiple road closures and detours. This document lays out the best way to avoid congestion with runners to ensure the quickest and easiest way possible to parking at Summit. Closures and detours hopefully should not affect the overall meet but coaches and volunteers arriving early may be affected. ​For meet participants coming from downtown/Old Mill area they will need to detour around Galveston Ave by proceeding South to Colorado Ave. The roundabout at NW Crossing /Mt Washington will be closed preventing people from getting from Newport to Summit HS.